How would you like it if your car told you to take a break? With technology becoming more sophisticated by the day, it was only ever a matter of time before your car assessed your driving. But do you really want your car watching your every move and even your fitness to drive? We’ve heard tales of self-driving cars being on the horizon for decades. All those Back to the Future-esque advancements we’d only dreamed of are coming to fruition. We already have cars that can park themselves, maintain a safe distance behind the car in front, stop you drifting out of your lane, spot errant pedestrians and even apply the brakes if they think you’re about to crash. So what’s next – cars that could start to monitor our health, our concentration and even decide for themselves whether we are safe to be behind the wheel? If the monitors decide you’re not in a fit state they could go as far as disabling the car. 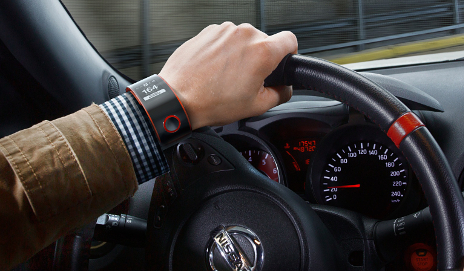 Nissan’s latest contribution to these developments is the Nismo smartwatch unveiled at last week’s Frankfurt Motor Show. We’ve already seen smartwatches from Sony and Samsung which can filter the functionality of your phone onto your wrist and assess your health by counting your footsteps and tracking your blood pressure and heart rate. However, Nissan’s smartwatch could go one step further, harvesting even more of your biometric data by scanning your heart and brain. Nissan claims that the purpose of this is to identify early fatigue, monitor concentration, body temperature, hydration levels and even emotions. As well as assessing drivers’ physical wellbeing the smartwatch could keep tabs on your social media activity across Facebook, Twitter, Pinterest and Instagram. And Nissan is far from the only car company developing technology to keep an eye on drivers’ physical state. Ford’s recent S-Max concept car introduced the ability to monitor a driver’s blood sugar level. But do you welcome your car being able to monitor your health in addition to your driving? Would you find it helpful if your card told you it’s time to take a break or is this a technological step too far? I wouldn’t trust technology to drive me to the nearest doctor – I’d have to wait a week to get an appointment. I think watching your eyes to detect if you are dozing off is tried and tested and a sensible gadget. There is the means of linking a breathalyser to your vehicle to disable the vehicle if you are near or over the limit. Is this a good thing? It seems to make sense for taxis, public service and commercial operators. Would individuals, though, be given a false sense of security by drinking near to the limit rather than abstaining? I’m not sure how a device to immobilise your car if you’re over the limit would work. If it just sniffs the air in the vehicle how does it know whose breath it’s smelling? If you have to blow down a tube how does it know who (or what) is blowing? The idea of a warning system based on driver alertness metrics is excellent. This is one of those things like blind spot warnings, lane departure warnings, emergency brake assist and so on that originate in high end cars and will hopefully work their way down to the average motor. Remember when ABS was a luxury or an optional extra? On long journeys, when driving on crowded motorways I like to take a break after about two to three hours as I find around that time I start to feel tense. I pull into services and have a coffee and a walk around to stretch my limbs and roll my shoulders. I would welcome a device that would check my alertness to drive and warn me to stop for a break.